A surprisingly moving comic adventure, based on a true story, about the heights one man will climb in the name of True Love. A breathless and joyful journey that takes us from a housing project on the outskirts of Paris to the summit of Mt. Everest. 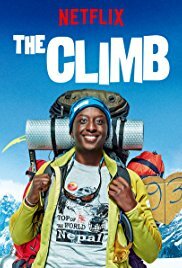 In the new Netflix French production that’s sure to be as much of a crowd pleaser as 2011’s The Intouchables, enter The Climb (L’Ascension). In this shaggy dog story, Samy Diakhate (played by the genial Ahmed Sylla) is a young, aimless Senegalese-French guy living with his close knit family in one of the poorest suburbs of Paris, Seine-Saint-Denis. His lifelong crush from grammar school is Nadia (Alice Belaïdi), who won’t give Samy the time of day until he proves himself worthy of her heart. He jokingly challenges her to grant him a real kiss if he successfully climbs Mt. Everest, to which she sardonically agrees. Samy barely remembers Mt. Everest as a footnote in an old textbook, and his entire experience in climbing amounts to the flights of stairs from the street to his family’s cramped apartment. But he’s on a mission of love, and next thing you know, Samy has nabbed a few endorsements from local businesses, including the local urban radio station, and before you can say Namaste he’s on a flight bound to Kathmandu, Nepal. Thus begins Samy’s journey from complete poseur (he lies about his climbing credentials to be accepted onto the French expedition) to earnest neophyte, relying on the skills of his trusted Sherpa, Johnny (played by Umesh Tamang) to teach him a crash course in alpine climbing in exchange for bedtime reading from the dime-store romance novel Samy’s mother made him pack. Throughout the journey, Samy calls in to give live status updates to the radio station and thus quickly becomes a minor celebrity in his neighborhood and then throughout the country. But how can this likable underdog ever succeed in conquering the highest, most imposing mountain in the world? He’ll need more than love in his heart and luck on the slopes to achieve what only a few in the world have accomplished. As Samy climbs higher and higher, he is forced to forge deeper and deeper into his core to mine the strength and determination to reach the top of the world. Director Ludovic Bernard adapted the screenplay, which was loosely based on the book of Nadir Dendoune (Un Tocard sur le Toit du Monde, translation: A Loser on Top of the World). In 2008, Dendoune (a freelance journalist) became the first French-Algerian to reach the summit of Everest, capturing the moment with a picture of himself holding up a hand-scrawled sign with the number ’93’, in tribute to his Parisian suburb. As in the movie, his feat was all the more stunning in light of his having no climbing experience whatsoever. You may be familiar with Ludovic Bernard’s work as an assistant director on such films as Tell No One, Luc Besson’s Lucy, and the Taken franchise. Here with The Climb he marks his directorial debut. Nothing like starting out of the solo gate making history: The Climb is the first feature film shot on location at the South Base Camp of Mt. Everest. The stunning scenery, shot by Cinematographer, Yannick Ressigeac goes far to capture the majesty and the ever-present danger inherent in the climb up Everest. Despite the movie’s marketing campaign packaging it as a light-hearted comedy, The Climb resonates most as Samy learns ‘the ropes’ on the fly during the arduous preliminary hikes, under the wing of his French expedition leader and his Sherpa. Once snow and ice are reached, it becomes a whole different thing entirely. And although there are still plenty of comic touches, with the requisite cuts to the drama back home as family and friends wonder if he’s dead or alive, Samy’s outer and inner journey merge into one single, epic moment of human endurance and will. And it’s totally worth the wait. The Climb is presently streaming on Netflix. So glad you enjoyed this charmer, Lisa. Keep your comments coming!